The grass carp, or white amur, is a very large fish in the minnow family (Cyprinidae) that can weigh up to 70 pounds and grow to around four feet. They are silver to olive in color. Their body is torpedo shaped with moderately large scales, while their head has no scales. They appear very similar to common carp, however grass carp do not have the barbels or fleshy projections near the mouth. Newly hatched grass carp feed on benthic invertebrates and zooplankton until they reach about two inches, when they switch to vegetation. Adults consume primarily aquatic plants, but can also consume terrestrial plants, detritus, insects, small fish, worms, and other invertebrates. Grass carp become sexually mature between four to six years old. They spawn when water temperatures are between 62.5°F and 79°F, and require flowing water for reproduction. Grass carp are native to southeastern Russia and northwestern China. The species was imported to Arkansas in the 1960s to control aquatic plants in reservoirs and aquaculture farms. They have been purposely stocked in waters of other states. Large flood events allowed the species to escape, where they reproduced and established wild populations. They continue to spread through flood events and through migration within connected river systems. Wild populations of grass carp exist in the United States. No populations are known to be established in Minnesota, although individual fish have been caught in the Mississippi, St. Croix, and Minnesota rivers. 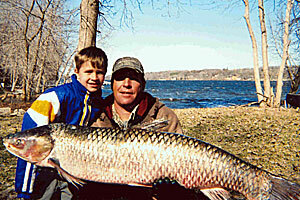 There is no evidence of grass carp reproduction in Minnesota waters. Refer to EDDMapS Midwest for current distribution. The grass carp (Ctenopharyngodon idella) is a prohibited invasive species in Minnesota, which means it is unlawful (a misdemeanor) to possess, import, purchase, transport, or introduce this species except under a permit for disposal, control, research, or education. Grass carp cause recreational, economic and ecological damage—changing how residents and visitors use and enjoy Minnesota waters. Their feeding can dramatically reduce aquatic vegetation. They can harm water quality by increasing phosphorus levels. People spread grass carp primarily through the improper use and disposal of live bait. If introduced, they can spread on their own through connected waterways. Clean watercraft of all aquatic plants and prohibited invasive species. Dry docks, lifts, swim rafts and other equipment for at least 21 days before placing equipment into another water body. Report new occurrences of grass carp to the DNR immediately by taking a photo and making arrangements with the DNR to transport the carp to the nearest fisheries office. To keep invasive carp for personal use, download the Special Permit to Possess Prohibited Invasive Species of Carp. The DNR has a monitoring and removal crew that conducts standardized and random sampling to detect, monitor, and remove invasive carp from Minnesota waters, including larval stages to adults. Survey efforts and capture events can be found in the MN DNR annual invasive carp report. The invasive carp action plan guides the DNR’s efforts in controlling invasive carp. The plan lays out actions to assess population expansion of invasive carp and describes efforts to prevent and/or minimize their impact in Minnesota.